Alan Kurschner of Eschatos Ministries is joining our group (www.powerpointsermons.net) to provide resources for the “last days” church. Alan is an academic. Take a look at his bio: He holds an MA in biblical languages (Gordon-Conwell Theological Seminary), graduate studies in New Testament (Harvard Divinity), and a BA in philosophy (University of Wisconsin–Eau Claire). He is a PhD candidate studying Greek linguistics (McMaster Divinity College). Areas of research include Greek linguistics, the book of Revelation, eschatology, and hermeneutics. He also runs the Center for Learning Biblical Greek. At the same time, Alan understands the need to heed Jesus command to evangelise the lost, and importantly, the value of proclaiming the coming day of the lord. I hope you will be challenged as I was by the following report. Part of Eschatos Ministries’ mission statement says that we exist to proclaim the Gospel of the second coming of Jesus to the lost. Jesus did it. So did his disciples, including the apostle Paul. We must do the same. Jesus is coming back either as Savior or Judge. 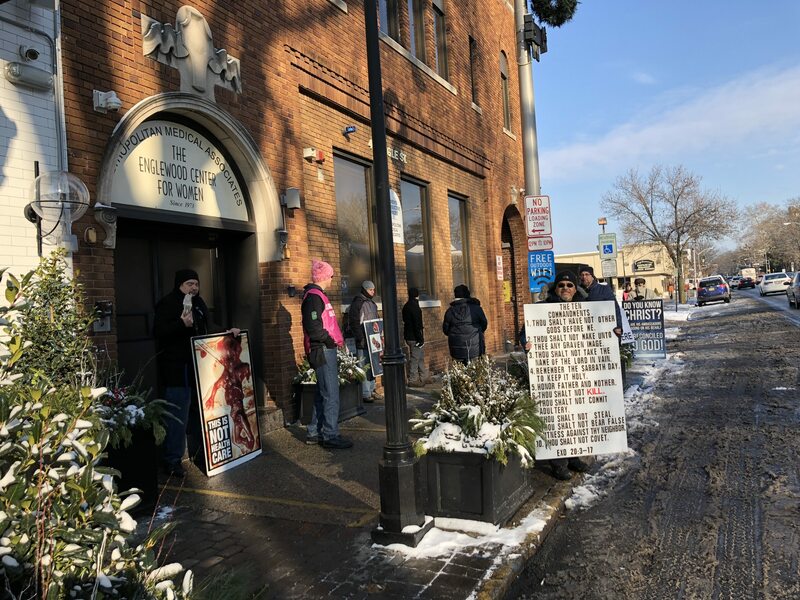 This morning some church friends and myself went to the largest abortion clinic in New Jersey telling people to repent of their sins because the return of Jesus is nigh. Some mocked. Some were indifferent. Some listened. Many babies this morning were murdered being torn apart or burned to death by the abortion “doctor.” Satan was certainly not bound in the abyss this morning! Abortion is unabated Satanic activity. But thanks be to God, one of the many women who entered the abortion mill heard the gospel message and changed her mind, and got her money back. The gentleman with her came out and hugged Rob Parker for vocalizing the message through the abortion doors (he is in the photo standing next to the door with the placard). Pray that this woman’s conviction is genuine and that the Spirit will convert her to Christ. I was able to have some fruitful discussions with several people, including an Uber driver who dropped off a mother to kill her baby, sadly. The driver was receptive to the gospel. Pray that the Spirit will convict him. His Word does not return void. Pray that God restrains the wickedness of abortion in this land and bring repentance to abortion doctors and the politicians who support and celebrate their monstrosity of evil. If you live in North Jersey and belong to a Bible believing church come join us. You can contact me for details.